Now you need select your audio source, please choose your microphone from dropdown box. Go to Zones tab and select zones to play your voice announcements. 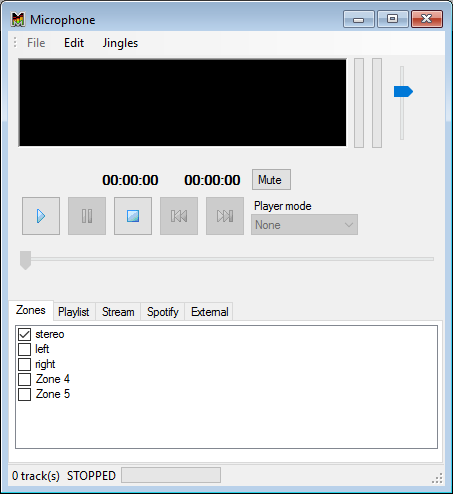 Only Play and Stop buttons available for External player, so please press Play and start speaking to your microphone. You can hear your voice in the selected Zones. You can change Zones on the fly, but please keep at least any one always selected, otherwise you have to click Play button again. Please press Stop button to turn off your microphone. If you need tune your microphone level, please use horizontal fader below source box. If you enable “Automatically reduce the volume of other players” checkbox, the volume of other players playing to same zones will be reduced automatically, really useful feature. Next → Next post: German site translation is ready.